On Tuesday, July 27 more than 1,000 bicyclists and their families will arrive in Pequot Lakes, their third stop on a five-day, 200-mile bicycle ride to raise money for Multiple Sclerosis - 2010 MS TRAM. How can your business get involved in welcoming and providing services to this captive audience? Sponsor the entertainment or tech center to promote your business with signage and have personal interaction. Volunteer for a minimum two-hour shift between 9 a.m. - 5 p.m. on Tuesday, July 27 in areas like the bike corral, water station, information, directions, rv parking, and more! Beginning at 7:00am on Saturday, July 24, eastbound and westbound motorists on Highway 10 from County Road 7 to just north of 15th Avenue in St. Cloud will encounter a traffic switch to the newly-constructed eastbound concrete roadway. This traffic switch will allow crews to begin work on the westbound lanes. Two way, two lane traffic will be maintained on this portion of the project for approximately the next three weeks. Mn/DOT wants to remind motorists to slow down when entering a work zone and expect delays, especially during peak travel times. U.S. bank failures this year have surpassed a bleak milestone of 100 as regulators shut down banks in Georgia, Florida, South Carolina, Kansas, Nevada and Minnesota. In Minnesota regulators took over the Community Security Bank of New Prague. The day's bank failures bring to 102 the failures so far this year. The Crow Wing County Lakes and Rivers Alliance is embarking on a campaign to stop the spread of invasive aquatic species. Spokesperson Paula West tells KLKS News, invasives such as curly pond leaf, Eurasian water mil foil, zebra mussels and spiny water fleas are already in Brainerd area lakes. To keep them from getting into more lakes, they are promoting the slogan "Clean, Drain and Dry." West says boats must be totally dry, because it takes about a week to kill zebra mussel larvae once they are out of the water. Motley is the scene of the 4th annual Two Rivers Music Fest this weekend. Organizer Larry Beckner says the event begins tonight with gospel music. It continues tomorrow with more music at noon, featuring the Unbelievable Uglies. The talent contest begins at 3 p.m. The Parade begins at 11 a.m., with 60 units registered. The Minnesota Department of Transportation has prepared a Supplemental Final Environmental Impact Statement for the Highway 371 improvement project in Cass and Crow Wing counties. The Highway 371 project corridor extends approximately 16 miles from the intersection of Crow Wing County Highway 18 in Nisswa to the intersection of Cass County Road 2/42 in Pine River. This segment of the roadway was the subject of an Environmental Impact Statement process that was concluded in 2005. This statement was prepared to address recent changes to the preferred alternative, based on a request from the city of Pequot Lakes to change from a through-city design (2005 preferred alternative), to a bypass. This statement focuses the impacts in the areas affected by the design change to a bypass of Pequot Lakes. The statement also includes a reevaluation of the entire project corridor to document other minor changes that have occurred since the original Record of Decision was signed in 2005. Copies of the Highway 371 statement are being distributed to those agencies on the current document review list made available by the Minnesota Environmental Quality Board. The comment period will begin on July 26th, and will extend through August 9th. Written comments on the adequacy of the statement should be submitted to James Hallgren, Mn/DOT project manager, Minnesota Department of Transportation – District 3, 7694 Industrial Park Road, Baxter, MN 56425. Copies of the statement are available at area libraries and city halls. This weekend is "White Cane Days" in the Crosslake Area. Marj Bundgaard of the Whitefish Area Lions club says members will be out asking for a dollar donation to help in the battle against eye disease. Money raised from the effort will go to The University of Minnesota Lions Eye Bank. The Lions will have balloons for the kids. 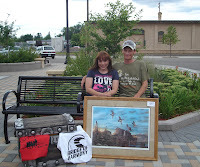 The DowntownBrainerd.com Medallion Hunt, held in conjunction with Brainerd Main Street’s Crazee Daze, was found Wednesday morning by Gene Michelson. Gene is from Brainerd and works part time for a log finishing company in the area. His favorite thing about downtown Brainerd is the newly completed reconstruction, especially the new seating areas and planters. 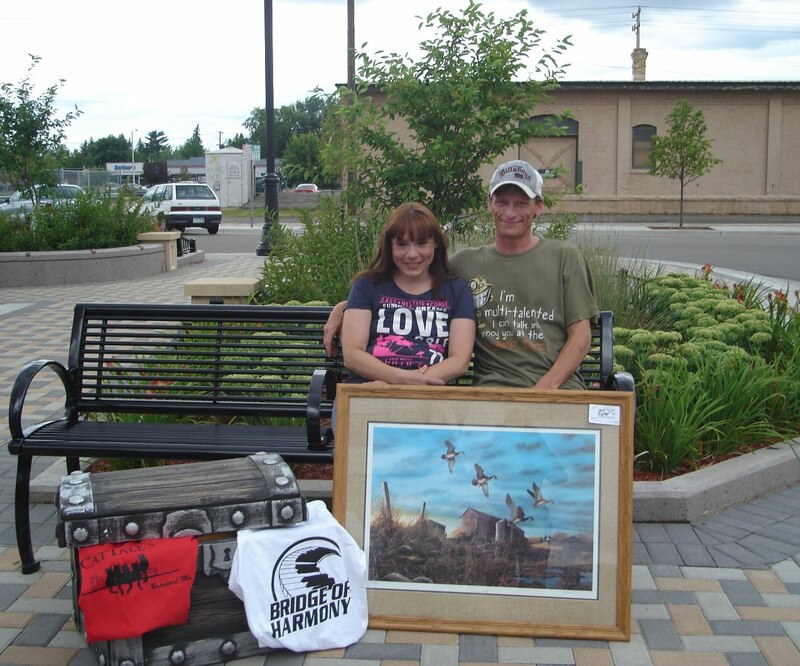 The Medallion Hunt is sponsored by Brainerd Main Street, a program based on the national four-point approach to community revitalization, coordinated by the Brainerd Lakes Chamber. (AP) Alfonso Rodriguez Jr. is running out of options. 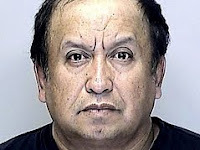 The 57-year-old Crookston man is in what is considered to be the final step of his murder conviction. Rodriguez is on death row in Fargo for the 2003 kidnapping and murder of North Dakota Student Dru Sjodin of Pequot Lakes. A federal appeals court has already upheld the death sentence. A Northwestern University law professor has been appointed to lead Rodriquez legal team in the so-called habeas corpus hearing. A half scale replica of the Vietnam Veterans Memorial Wall is on display in Crosby. The memorial arrived today, and will be open for public visits through Monday at the Crosby Memorial Park on Serpent Lake. Bill Leonhardt of the Deerwood VFW tells KLKS News, his post and the Ironton VFW post have been working a year to bring the wall to Crosby. Leonhardt says they don't call it the moving wall because it is on wheels, but rather because of the emotion it draws. There will be an opening ceremony at 5 p.m. today, another one with speakers at 1 p.m. Saturday, and a closing ceremony at 5 p.m. Monday. There is no cost to view the display that hosts the names of over 58 thousand Americans who died as a result of the conflict. As the third anniversary of the collapse of the I-35W bridge collapse in Minneapolis approaches, 20 percent of the nation's bridges are structurally deficient. In Minnesota that number is 12 percent. The House Committee on Transportation and Infrastructure, chaired by Minnesota congressman Jim Oberstar, held a hearing to assess progress on the bridge inspection program. Witnesses testified states are doing more to inspect bridges and identify problems in aging bridges, but programs across the nation remain under-equipped and under-funded. Oberstar's has introduced a bill which would require states to certify that they have no structurally failing bridges before they are allowed to shift federal bridge funding to other purposes, which they currently are allowed to do. The 8th District DFL-er says it would also pay for new scientific testing and inspection technologies for bridges across the nation. Currently, over 73,000 bridge across the nation have been rated as "structurally deficient." The man known as "Mr. Paul Bunyan Trail" has died. Terry McGauhey died at his home in Brainerd Wednesday. He was 71. McGauhey has been working on developing the old railroad bed that runs through the Brainerd Lakes Area into a bicycle trail since 1983. The legacy he leaves behind is a paved trail that extends from Baxter to Bemidji. Efforts are underway to expand it even further. The trail is used by thousands of hikers, bikers and roller bladers each year. McGauhey has drawn praise for his vision and efforts from Brainerd to the nation's capitol. 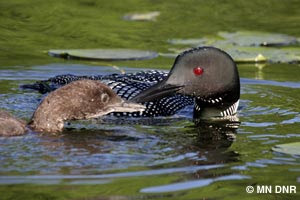 Up to three Quarters of the loons that nest in Minnesota migrate to the Gulf of Mexico over the winter, according to DNR Non Game Specialist Pam Perry. She says they don't know what percentage will be flying to the oil polluted areas. But, a few will be equipped with radio transmitters to track their destination. Perry tells KLKS News, if they get into oily water, the results will be bad. She says if loons get oil on their feathers they will drown. Perry also says, if they preen the oil off their feathers, they could be poisoned. Perry says the results of the loon hatch in the Brainerd Lakes Area has been mixed this year. Some started too early, which required a second clutch. She says if the lakes ice up early this year, the chicks may not be strong enough to fly away. The Minnesota Pollution Control Agency is seeking comments on a water quality improvement report for the Lake Margaret Watershed in Cass County, near the city of Lake Shore. The report, known as a Total Maximum Daily Load, focuses on pollution caused by excess nutrients in the lake. Lake Margaret was placed on Minnesota’s list of impaired waters in 2006. A public comment period runs through August 18th. 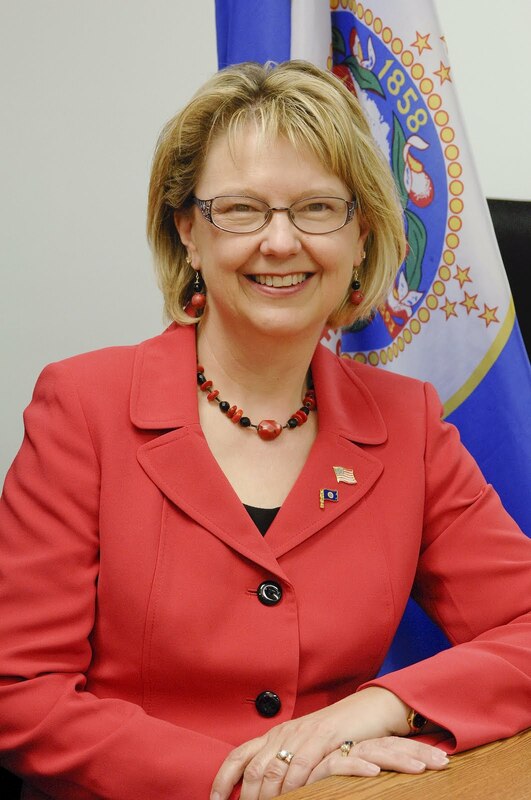 Bemidiji State Senator Mary Olson held a public forum on health care issues today. Olson says, "On both the state and federal level, health care has become one of the most politically-contentious issues." She says she wants to get beyond the rhetoric and provide the facts about what is happening in the health care system, and how it is affecting Northern Minnesota . Senator Olson says the region was adversely impacted by Governor Pawlenty's decision not to enroll vulnerable Minnesotans into Medical Assistance; and feels Northern Minnesota hospitals could benefit from a proposed change to provider surcharges. 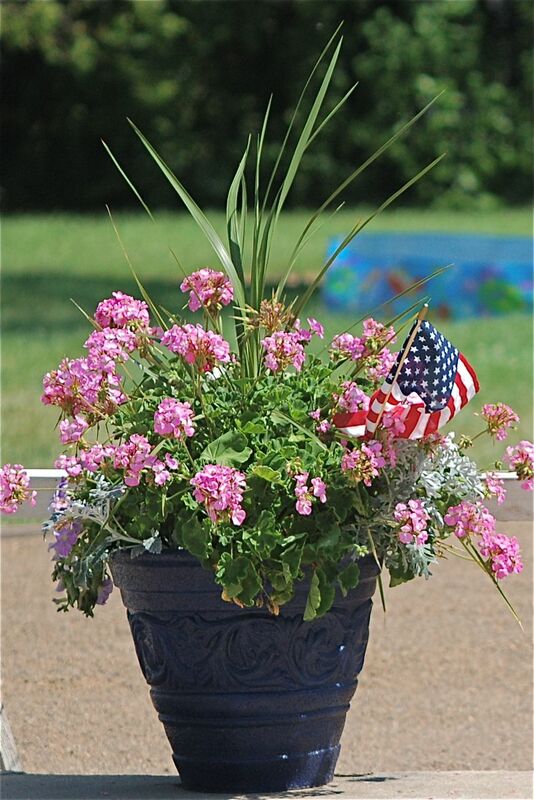 A large, dark blue flowerpot containing an American flag and planted with pink geraniums, dusty miller and a tall spike was stolen from the corner of Curtis Avenue and Second Street in Ironton (also known as Flanagan’s corner). It was taken in the evening or during the night of Monday, July 19. This pot was one of four placed, paid for and maintained by the Serbian Sisters organization and volunteers. For five years the historical and cultural group has paid for beautification efforts in town in honor of the first immigrants to the area. The organization wants the flowerpot be returned to the corner. No questions asked. Whether rain or shine, Pequot Lakes Bean Hole Days’ continues the town’s seventy-two year tradition. Over 3,000 bowls of the closely guarded secret bean recipe were served to legume aficionados last Wednesday. New this year, were Bean Hole Days souvenir bowls. Two hundred were sold in just over an hour, and are promised to be back next year. Over seventy crafters and vendors also participated. The new “Queen Bean” is Taren Saccoman, honored for her sense of community and hard work to make Pequot Lakes a better place. Taren has helped run Bean Hole Days for many years and volunteers large amounts of time to the other Pequot Lakes Community Events. 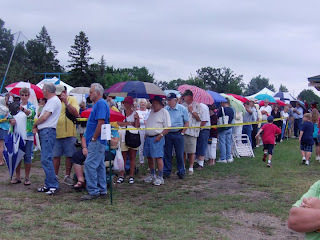 At the Community Picnic sponsored by the Initiative Foundation on June 22nd several people indicated interested in having a dog park in the Brainerd - Baxter area. A meeting of those interested in moving forward with a dog park will be held Wednesday, July 28th at 7:30am at the Sawmill Inn in Brainerd. Those who cannot attend this meeting but would like to work on the project should email Dan Hegstad at: dan@danhegstad.com or call 851-5900. Usually, Paul Bunyan and his sidekick Babe are larger than life around the Brainerd Lakes Area. But a new a sterling silver charm brings Paul & Babe down to more manageable size. The new charm, cast and created by Merritt Jewelers, features a boxed in version of Paul & Babe similar to the logo of the Paul Bunyan Scenic Byway, a nationally-recognized driving route in northern Crow Wing and southern Cass County. The design is perfect for anyone looking for a unique item to remember their vacation or visit to the region. The charm will be available via a booth to MS Tram riders on Pequot Lakes on July 27, as well as through the Paul Bunyan Scenic Byway’s web site and at Merritt Jewelers. 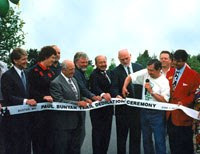 To learn more about these unique roads or about the Byway Association, visit PaulBunyanScenicByway.org. BAXTER, Minn. – Motorists traveling on area roads in Crosby, including Highway 210 and Highway 6, should expect traffic delays as visitors attend the “The Moving Wall” event at Crosby Memorial Park, on Serpent Lake from July 22-26. “The Moving Wall” is a half-scale replica of the Vietnam Veterans Memorial Wall in Washington, D.C. and is expected to draw up to 100,000 visitors. Motorists traveling in Crosby are advised to slow down, expect delays or sudden stops and watch for personnel directing traffic. Those traveling to the cities of Duluth or Aitkin are advised to find alternative routes around Crosby. Grand View Lodge in Nisswa will be hosting the first Tee it up for the Troops event August 26th. The event is a fundraiser for Project New Hope a non profit organization that provides veterans and their families the education, training, and skills necessary to manage their lives after wartime service. After serving in combat, the statistics for veterans and their families shows spikes in divorce, substance abuse, job loss, home loss, physical abuse, and suicide. At Project New Hope, veterans and their families are given a weekend retreat, away from the demands and distractions of their daily lives, and spend time together with counselors from the Department of Veteran Affairs. There is no charge, instead, funding is sought from corporate and fundraising events. The entry fee for the golf event is $100 per player and includes 18-holes of golf with cart, tee prize, and banquet dinner at the Gull Lake Center following golf. The tournament banquet will also serve as location for the drawing for a 2011 Ford Mustang Convertible which concludes Project New Hope’s year long raffle.